“IT’S WACKY…IT’S FUN…IT’S CRAZY – IT’S OUTRAGEOUS!” These aren’t words that would describe a Simpsons NES game or Silent Service, but the introduction to the kids game-show Fun House that was on UK television in the late 80’s and early 90’s. Introduced in the United States before making it’s way to the UK, it was a game-show that had a number of things – it had fun, it had gunge, it had go -karts, IT HAD THE TWINS!! So how can you package all that fun into one little grey NES cart? Did the game make you want to live permanently in the (Fun) House or just sit in a bath full of gunge with the host rather than the twins? 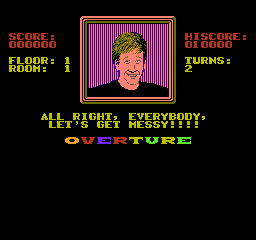 Fun House was released on the NES in 1991 in North America only which meant unless you modified your NES, European gamers never had the chance to play this game – with good reason. The game of Fun House is supposedly based on the US version of the show to which this reviewer has not witnessed, but like all popular game-shows that was in the US in the 80’s such as Win, Lose or Draw! and Wheel of Fortune, the transistion was made to an NES game. If you’re not aware of the Fun House television show then this review may be wasted and would urge you to watch clips of it on YouTube but then again that may not be a bad thing. If you’re expecting this to be like the television show, then be prepared. Do you remember this episode of Fun House?? Remember the episode where the audience was replaced with shapes? But anywho you get thrown in to the game with a top down view which instantly reminds you of Smash TV but without the enemies spawning from the sides of the room. Or the intensity. You press the D-pad to move around…and don’t move. You can press up down left and right but you won’t move an inch. By pressing left or right you’ll spin in a circle on the spot, unlike pretty every other NES game where the d-pad moves your character, you have to press the A button. There are other games that may need you to move in this way such as racing games but not action games, well as action as a US game-show can get. 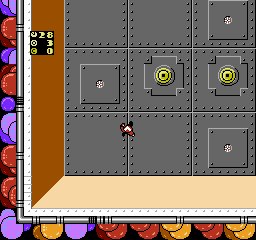 There’s no instructions on screen however the idea of the game is to move around throwing red projectiles that look like balls or whatever the programmers decided they looked like at targets and numbers. When you collect the final target or the final number, you collect the key and then you’re then taken to the next stage to do…. the exact same thing. 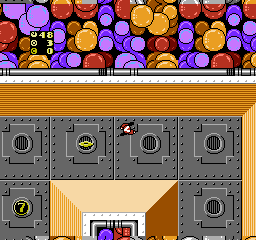 It’s like “Hey kids, do you remember watching Fun House where a guy runs around aimlessly shooting bullets or projectiles at a number and collecting a key whilst being fired at with guns and cannons?” Oh yes, there are enemies in Fun House out to get you, not Contra-style but stationary shooting random projectiles at you in order to stop you shooting at the targets. So you go through each stage doing the exact same thing, shooting targets and numbers in a sequential order which happened in every single episode of Fun House didn’t it? Bearing in mind I can only go by the UK version of the show so if this happened in the US show then please do comment but in what world does shooting targets in hundreds of stages with which the only thing that changes is the colour palette make good television? But this isn’t about the television show, this is about the action-shooter game Fun House that has NO basis on the TV show. As bad as they were, at least you could argue that Win, Lose or Draw or Wheel of Fortune was a game on the actual show – imagine the furore if Wheel of Fortune was turned into an action-hack and slash game on the NES, the Daily Mail would have been up in arms! 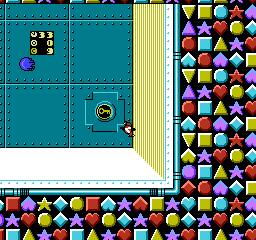 There are 12 stages and 72 levels in total in Fun House, and before each level there is the name of the level such as Four Corners or One, Two or Three. It’s a very loose idea of what to do in the level however the levels all consist of the same action. You move with the A button as mentioned earlier and shooting your projectile with the B button whilst you turn left or right with the D-pad. 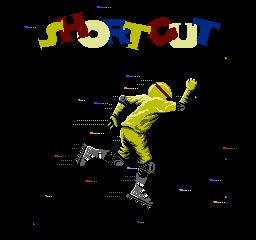 The controls are not as difficult as other games which is good and could have been a lot worse. Music-wise, it sound’s a mish-mash that reminds you of the music from Action 52 in it’s quality – bad. It doesn’t get you pumped out for go-karting or getting covered in gunge having fun and mayhem… oh wait this isn’t the TV show, this is a generic action-shooter where you shoot numbers! Regardless, the music is somewhat dreadful and is as good as scratching nails down the chalkboard. Fun House is mediocre at best but the worst aspect of the game is that it has NO BEARING WHATSOEVER to the TV show. 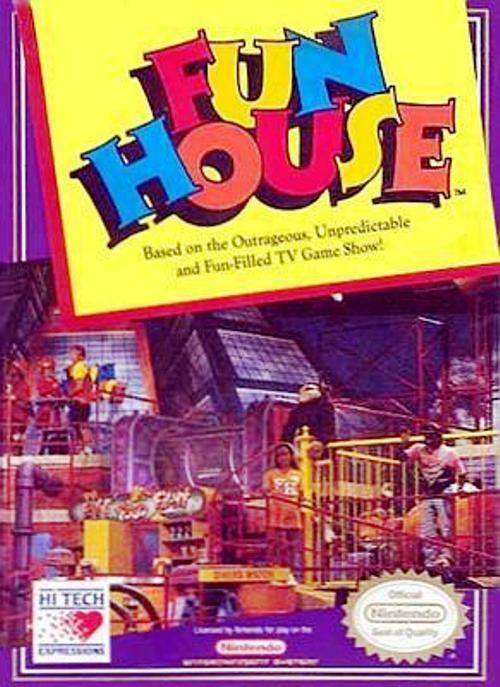 As good or as bad American Gladiators is and other NES games that was a US-TV show at least you could argue that they had some bearing to the TV show and felt like you were playing a game-show, but this game has nothing to do with Fun House. It is a mystery why it lent the name of a popular show to an action-shooter game with a top-down view with the only thought being it was for the money. For this review I didn’t manage to get to the final stage which may or may not have been a minute of fun in the House but the game was just too repetitive and boring to keep going for 72 levels. Your character on screen speeds around like he has ants in his pants or just on crack and you forget it is a character shooting projectiles, it felt more like you’re controlling a car. The graphics are bright colours but when did you watch the show and see circles and triangles as the audience? It is highly recommended to stay away from this game and do yourself a favour – build a shed get some gunge and some hot twins maybe a go-kart and make your own Fun House then play this. Or just play a proper action-shooter.